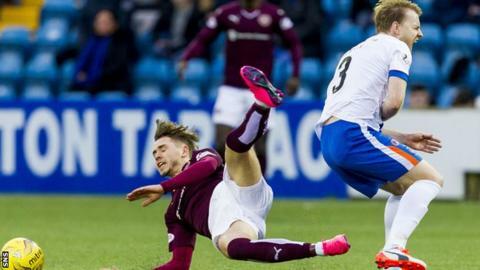 Hearts head coach Robbie Neilson fears players will pick up injuries because of Kilmarnock's artificial pitch. And he has urged the Ayrshire club to examine how they treat the Rugby Park surface, which was installed in summer 2014. Neilson was speaking on Hearts TV following Saturday's 2-2 draw between the sides in the Scottish Premiership. "There's a lot of people sliding about and I worry people are going to get injured on it," said Neilson. He said he was "all for" artificial surfaces "as long as they are looked after". "But if they are not looked after then it can be a hazard at times," said Neilson. Kilmarnock's artificial surface has hosted Scotland rugby fixtures as well as top-flight football. "It's not ideal," insisted the Hearts boss. "I don't want to be too harsh on it. "Sometimes you say it after getting beat or a draw and people think it's sour grapes, but I think it's something we need to have a look at."